A “Gun Safe” is a piece of security equipment that prevents the unauthorised access to long guns as well as hand guns. A Gun Safe protects children as well as the mentally ill and or unstable. 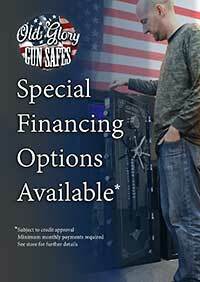 Gun Safes create a barrier that prevents a person from being able to take hold of a firearm in hand. This barrier is created by steel and a layer of x type fire rated material to not only prevent unauthorized human access but keeps out fires as well. In 2018 Guns in America are under fire on all fronts. Firearms owners have never had more pressure in history to lock up their gun as in today’s environment. There are many reasons that the politic of the day would want to put pressure on legal gun owners to guard more closely tools and implements that could be used in violent crime that could include robbery and even murder. The biggest reason is that there have been high profile crimes including children and schools that have been widely broadcast by the national media spawning even more violence. Even if guns are locked in safes violent crime will still take place in another form or another fashion. The liability for gun owners and the weak insurance policies is an undue burden remedied by the ownership of a premium fireproof Gun Safe from Old Glory Gun Safe Company. Truthfully there are many reasons to lock up guns beyond preventing violent crime and that is the fact that firearms and rifles are an American Heritage and should be respected and protected as personal property beyond the reach of government. This is granted to us in the U.S.A. Constitution. This is the people’s sacred document amended and respected. A “Gun Safe” is a piece of security equipment that prevents the unauthorised access to to guns by children. Gun Safe are responsible for saving the lives of thousands of children that may have otherwise gotten in a serious firearms related accident. It’s very sad but in today world if someone breaks into your home and uses your firearm in a crime that was facilitated by the purchase and negligent keeping of purchased gun you can be charged with an accessory to crime and held financially liable in civil court.